World Bolding Don't Just Build... Bold! Bethesda’s Creation Engine gets a lot of crap. Most of it is undeserved, in my opinion. First crafted for Morrowind back in 2002, and based loosely off the Gamebryo/NetImmerse engine, it’s an expansive set of tools that lets Bethesda’s game designers craft massive worlds full of different gameplay mechanics. The massive nature of their games inherently means there are a lot of bugs, and sometimes that gets in the way of the fun. And causes online rage. I’ve written about their tech twice before. I love the way their lighting works now that they’ve incorporated Nvidia’s voxel-based volumetric lighting. But Fallout 76 was kind of a mess at launch…due in part to a feature I’m about to get excited over. The Creation Engine tracks the position of every single entity in its game world, at all times. You can pick up almost every object and put it down somewhere else. You can grab every cabbage in the world and put them all in a cabinet, or you can hoard every sword, or you can pile up shields outside an Inn. In Oblivion, they added physics calculations to all these objects. So now, each one could slide around and move with realistic weight. You can grab objects and use them to push everything off a shelf. You can cast spells or fire guns and watch debris and in-game items go everywhere. It’s glorious. But it also causes some issues, sometimes. On the PS3, with its split RAM pool, their games would eventually have problems tracking the position of everything. Each time you make a change to a game object’s position, your save game file can get a little larger. The larger it gets, the more likely the game will freak out and crash, especially on PS3. Bethesda patched this up a bit over time, but it’s still a potential problem no matter what machine you’re playing on. It’s understandable, since there are thousands of objects littered across the vast worlds of Fallout and Elder Scrolls. Fallout 76 struggles with this. It has to update locations of objects, enemies, and weapons, not just for you, but for all the other players on your server. They tried to limit this a little bit by making certain objects static, and by making loot chests spawn based on a server check right when you look at them, but it’s all ungainly. 76’s world is not the same dynamic, realistic-in-a-fun-way physics-object-filled interactive space that Bethesda’s other games present, though it comes closer than any other online game to that sort of freedom. I love being able to “accidentally” knock everything off the shelves in a shop. I love it when I drop an item and a character comes up and picks it up, and equips it. I love the way that party members will randomly equip the things you give them. Bethesda handles objects better than any other game developer out there. And it gives their games a tremendous sense of texture and tactile fun. The other day, I was revisiting Skyrim Special Edition, and I noticed that many of the shelves have screenspace reflections, so objects sitting on them have a subtle reflection underneath. 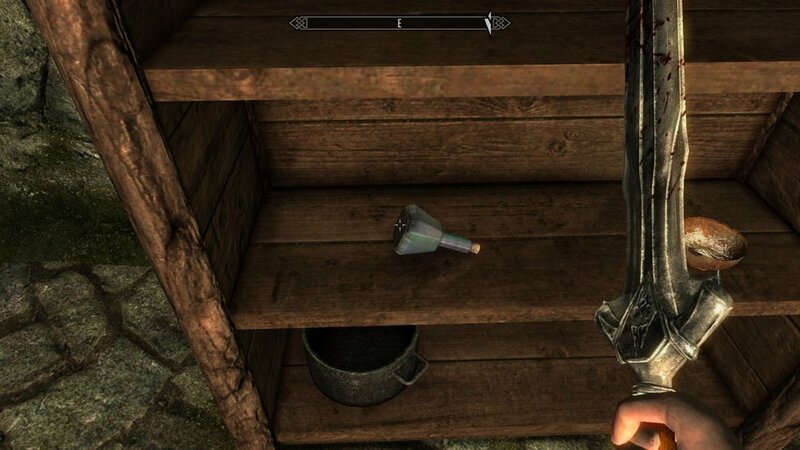 I spent a few minutes sliding this potion around on the shelf, watching its reflection move. I often feel like I want to reach out and touch a video game world, and Bethesda’s games actually let me do that, and in a way that’s also relevant to gameplay. I hope that Starfield and Elder Scrolls VI expand upon this, or at the very least, keep this functionality. So few other games have tried to copy this level of world interactivity, because honestly, it’s completely insane and demanding on the systems of the game. But it’s still cool to me, even 17 years after Morrowind came out. Apr 4 I'm going to try Black Desert I guess? Mar 28 PSA: Elite Pro 2 on Sale! Click Here To Support My Work.